Jansen, M.N., Lissenberg, C.J., Klaver, M., de Graaff, S.J., Koornneef, J.M., Smeets, R.J., MacLeod, C.J., Davies, G.R. (2018) Isotopic variation in Semail Ophiolite lower crust reveals crustal-level melt aggregation. Geochem. Persp. Let. 8, 37–42. MacLeod, C.J., Yaouancq, G. (2000) A fossil melt lens in the Oman ophiolite: Implications for magma chamber processes at fast spreading ridges. Earth and Planetary Science Letters 176, 357-373.
; sample names were shortened by omitting the numerals ‘95’ preceding the letters ‘OC’ and ‘OG’ and ‘14’ preceding ‘OM’). (b) An outcrop at the base of the layered gabbros was sampled at ~15 cm intervals (one sample per modal layer). Figure 2 Age-corrected 143Nd/144Ndi of (a) single clinopyroxene and (b) plagioclase crystals in the Abyad section. Clinopyroxene has a near uniform composition whereas plagioclase shows variability outside analytical uncertainty. Grey and white alternating bars at the base of the section indicate the individual modal layers of the sampled layered gabbro outcrop (not to scale). Coloured bars at the bottom of the figure represent the uncertainty for the two most extreme samples. Workman, R.K., Hart, S.R. 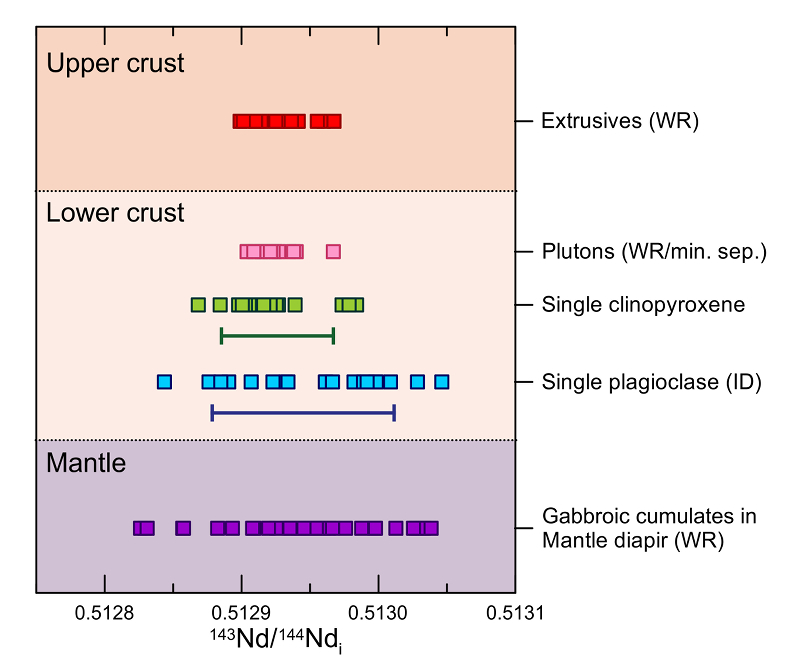 (2005) Major and trace element composition of the depleted MORB mantle (DMM). Earth and Planetary Science Letters 231, 53-72. McCulloch, M.T., Gregory, R.T., Wasserburg, G.J., Taylor Jr, H.P. (1980) A neodymium, strontium, and oxygen isotopic study of the Cretaceous Samail ophiolite and implications for the petrogenesis and seawater-hydrothermal alteration of oceanic crust. 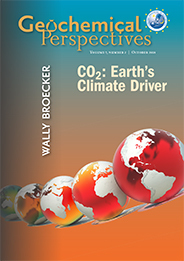 Earth and Planetary Science Letters 46, 201-211. 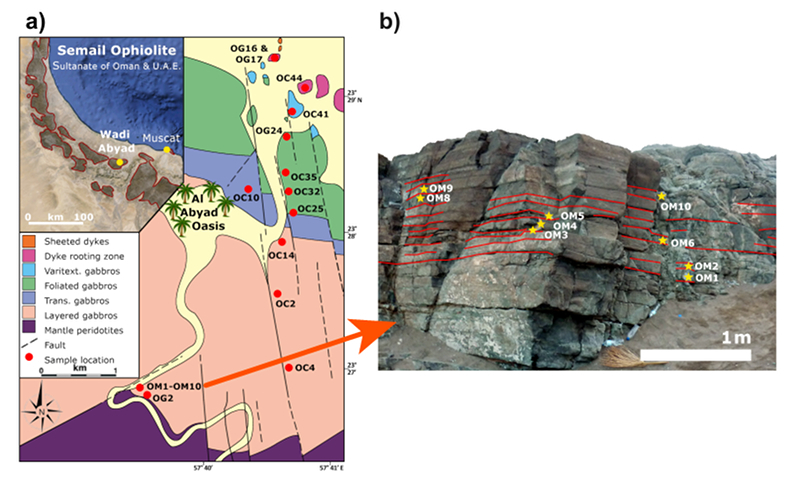 Rioux, M., Bowring, S., Kelemen, P., Gordon, S., Dudás, F., Miller, R. (2012) Rapid crustal accretion and magma assimilation in the Oman-U.A.E. ophiolite: High precision U-Pb zircon geochronology of the gabbroic crust. Journal of Geophysical Research: Solid Earth 117, B07201. 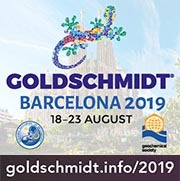 Rioux, M., Bowring, S., Kelemen, P., Gordon, S., Miller, R., Dudas, F. (2013) Tectonic development of the Samail ophiolite: High‐precision U‐Pb zircon geochronology and Sm‐Nd isotopic constraints on crustal growth and emplacement. Journal of Geophysical Research: Solid Earth 118, 2085-2101. De Graaff, S. (2016) Did the Oman Ophiolite form above a subduction zone? Evidence from widespread later-stage intrusions in the Central and Southeastern Semail Ophiolite. MSc thesis, Vrije Universiteit Amsterdam, 42 pp. ). (b) Age-corrected 143Nd/144Ndi and 147Sm/144Nd ratios show no correlation, whereas the present day Indian Ocean MORB array, shown for comparison, displays a broad positive correlation. Coloured bars in the centre panel represent the uncertainty in 143Nd/144Ndi for the two most extreme samples. 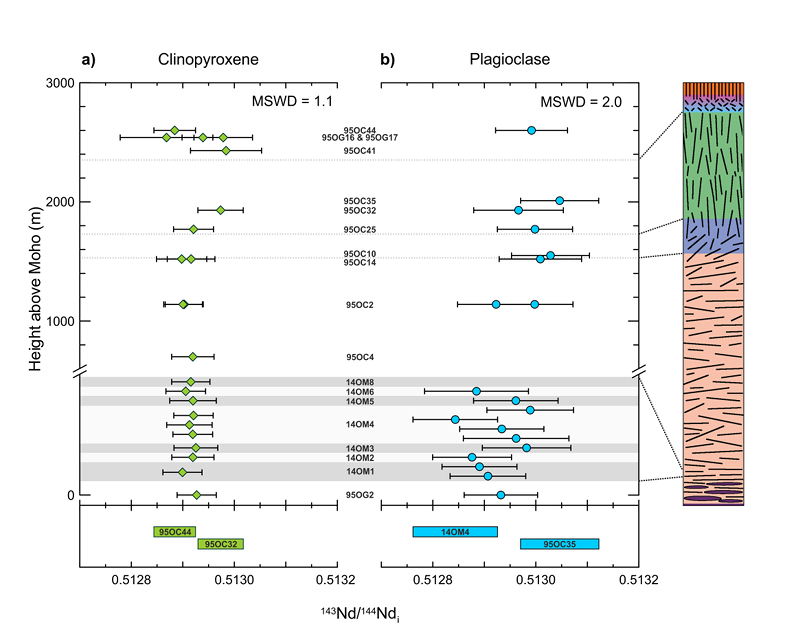 Benoit, M., Polvé, M., Ceuleneer, G. (1996) Trace element and isotopic characterization of mafic cumulates in a fossil mantle diapir (Oman ophiolite). Chemical Geology 134, 199-214. ). Range for repeated analyses of BCR-2 reference material is indicated by the green (1.9-2.6 ng Nd) and blue (0.15-0.34 ng Nd) bars (displayed at an arbitrary position on the x-axis).